In the oxygen-poor air of the Mesozoic era, nothing should have been able to move very fast. But Velociraptors could run 64 kilometers per hour. Their secret weapon: superefficient, birdlike lungs, which would have pumped in a constant supply of oxygen, according to a new study. This unique adaptation may have given all dinos a leg up on their competition. Biologists have long known that birds, which descend from one branch of extinct dinosaurs, have an unusual, sophisticated respiratory system that enables powered flight. But paleontologists have long debated whether those superlungs arose only in birds or earlier in dinosaurs. Unlike humans and other mammals, whose lungs expand and deflate, bird lungs are rigid. Special air sacs alongside the lungs do the heavy lifting instead, pumping air through the lungs, where the oxygen diffuses into the bloodstream. The lungs are attached to the vertebrae and ribs, which form the “ceiling” of the rib cage—all of which helps keep the lungs stationary. A connector called the costovertebral joint, where the ribs and vertebrae meet, provides further support. That setup allows for a continuous stream of oxygen and requires less energy than inflating and deflating the lungs. It also allows paleontologists studying fossils to learn a lot about the lungs by examining the bones around them. To find out when these superlungs evolved, paleobiologists Robert Brocklehurst and William Sellers of The University of Manchester in the United Kingdom, and biologist Emma Schachner of Louisiana State University in Baton Rouge turned to computer models. They compared the shapes of skeletal features like vertebrae and ribs in a range of bird and nonavian dinosaur species. 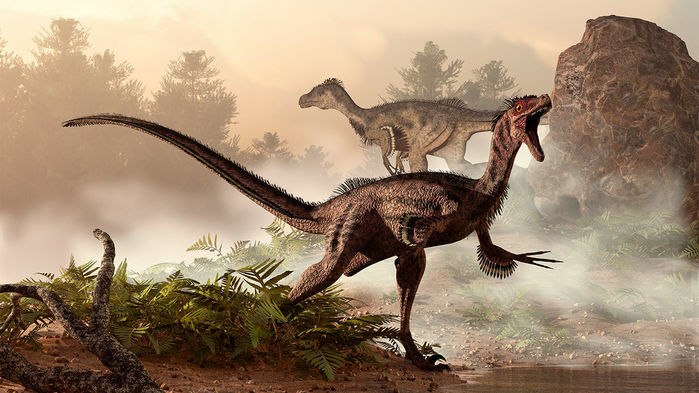 Many dinosaurs, including therapods like Velociraptor and Spinosaurus, a large carnivorous dinosaur, had similar lung architecture to birds, the team reports today in Royal Society Open Science. These dinosaurs sported a costovertebral joint and the birdlike bony “ceiling” of vertebrae and ribs that helps keep the lungs rigid. All of this suggests dinos had the same kind of efficient respiratory organs as birds, the team concludes. These superlungs may help explain why dinosaurs were able to dominate and spread, despite the rarified air of the Mesozoic, Brocklehurst says. Back then, the air was only 10% to 15% oxygen, compared with 20% today. The work sheds light on how birds’ extraordinary lungs evolved, says Jingmai O’Connor, a paleontologist with the Institute of Vertebrate Paleontology and Paleoanthropology at the Chinese Academy of Sciences in Beijing. “Birds are really weird compared to all other animals,” she says. “They have this highly evolved respiration system, [and] we’ve always wondered, ‘How did this evolve?’” Now, it seems likely that superlungs first developed in dinosaurs, and only later on evolved to support powered flight in birds, she says. But O’Connor adds that just because a fossil has the bone structure for birdlike lungs doesn’t necessarily mean it actually had such lungs. Finding lung tissue, which is almost never preserved, would be the clincher. She described what may be the first preserved lungs found in a bird fossilat the Society of Vertebrate Paleontology’s annual meeting in Albuquerque, New Mexico, last week and in a paper in theProceedings of the National Academy of Sciences yesterday. In that 120-million-year-old, dove-size bird from China, she and her team noted that although the putative lungs were sophisticated, the skeletal structure around them was primitive, suggesting bones and soft tissue may not evolve in lockstep.